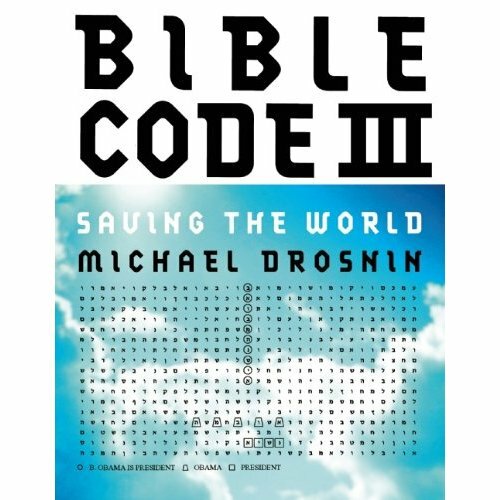 I heard from SI's Ben Radford today that there's a full-page ad in the NY Times for Michael's Drosnin's latest sequel to the Bible Code. In this new book, the reporter-turned-delusionary-megalomaniac thinks he alone can save the world, by getting Oprah to give his urgent message to President Obama. An excerpt from the book appears on Drosnin's site, specifically here. As I've done with the first two Bible Code books, I downloaded Drosnin's excerpt, and began using my own code application to search for Bible Codes therein. And I found some good ones in only a few minutes! The entire except is a whopping 3,681 characters in length after stripping spaces and punctuation, or just over one percent of the Torah's length (and codes improve greatly with text length). Even though the chapter is short, it teems with amazing "Bible Codes". One new result shows hidden codes for VAIN and HOAX appearing in Drosnin's new book, in excellent code style (which is supposedly found ONLY in the Hebrew Torah!). A second shows "MEGALO" nearby "MANIA". The hidden word "MEGALO" is quite a find in itself, since I estimated it would only be found once in every 35 similarly-sized excerpts (or so). Do these codes mean anything? Of course not! They just serve to show how easily hidden messages can be produced in any text, not just the Torah. 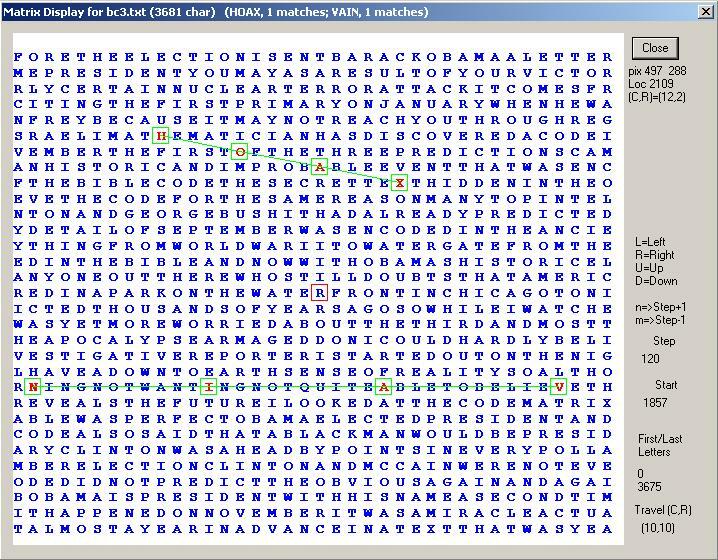 I searched for MEGALO-MANIA because I suspect that Bible Code III will be just more of Drosnin's megalomania that was so overdone in Bible Code II. The man really thinks he's the one individual who can save the World! I've a succinct write-up of Bible Code silliness from my TAM4 talk, here. 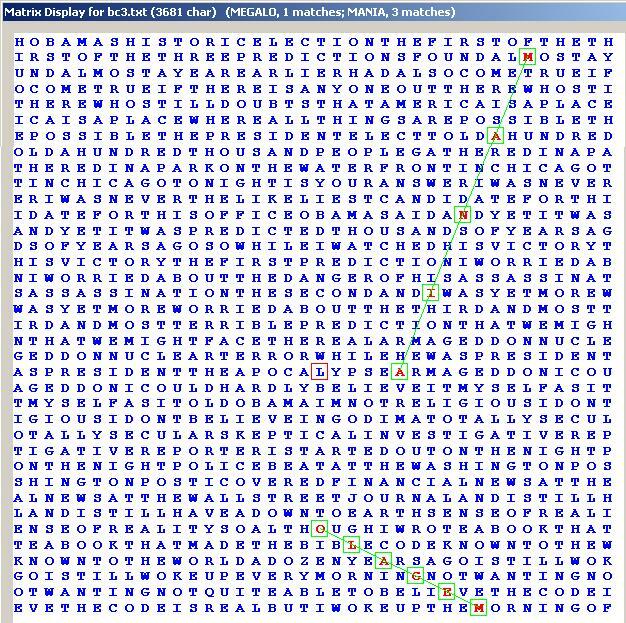 Ben Radford has also posted these hidden words from Drosnin's latest book at LiveScience.com, in the "Bad Science" topic area, here. He might have had better luck if he'd used the USPS. In his last Bible Code book Drosnin posited time-traveling space aliens as the source of the encrypted prophecies. He also credited them with creating life on earth by directed panspermia. He even went to Francis Crick to get support for this theory. He claimed in that book to have found, before the fact, that Yitzhak Rabin was going to be assassinated and said he tried to warn Rabin. He gave no supporting evidence to back this claim. I would be impressed if Drosnin could actually make a claim in print of a future event that was later proved to be true - specifically one that anyone would be unlikely to predict based on logical extrapolation. However, I doubt we'll see that in this or any other book he writes in order to keep milking the cash cow of popular credulity. Don't you get to strip the vowels too? This is oh so handy to create whatever you want to say. If you ever have the time, I would love to see the New Testament Writers thread in history/literature given the treatment. If you like massive amounts of texts, that is your huckleberry. There would even be extra equidistant letter arrangements because DOC reposts the exact same stuff endlessly. I don't strip vowels from English texts. However, doing so would make it much more like Hebrew. The implied vowels in Hebrew make it ever-so-much-easier to find equidistant codes. For example, when Drosnin found "Shoemaker-Levy" in his first Bible Code book, it was much easier than finding a match for the 13-letter English word SHOEMAKERLEVY. Instead, Drosnin used the much more compact Hebrew spelling, with the eight letters Shin,Waw,Mem,Kaf,Reish,Lamed,Waw,Yud ( ). (the letters read right-to left, starting with pitchfork-resembling shin). A basic rule of Codes is longer names are harder to match, as explained here. I wonder, assuming I could set up the matrix right, if I could find in the Bible Code the words: "Drosnin is blowing smoke up my ***." I'll settle for equidistant spacing of "Drosnin . . . blow . . . smoke . . . up . . . ***." OK, I downloaded ONE page of the NT thread (of 427) that Wolrab suggested, and found the message Tim thought might be lurking there! DaveThomasNMSR, that PDF article is really excellent! But there are two points that I don't feel you covered much in it. First, if you decide to search for a specific word by ELS-ing any text, you have a poorer chance to find it than a general word related to the topic at hand. Example: you can search for "Nazi", but your chances of finding it are less than searching for any word or phrase that could be even remotely connected with the Nazis, such as Hitler, SS, holocaust, WW2, Himmler, 1939, etc. Much like the interpretation of Nostradamus, the results can be used to "prove" pretty much whatever you want if your original goal is loosely defined. Second, I suspect that there are more versions of any part of the bible than just one, even the oldest Torah text. Do 100% of all existent, reliable copies agree 100% with every single letter, number and space? I doubt it. If even one letter were added or omitted from a version, this would make the ELS process totally different if any skip spanned that letter, and wipe out all words claimed to have been found. Pretty critical, I'd say. A good point! If you can't find NAZI, just look for EVIL, or REICH, etc. Kennicott and de Rossi have published much of this variant evidence, based upon extensive collations of Masoretic manuscripts available to them in the eighteenth century. In hundreds, perhaps thousands, of places these Masoretic manuscripts differ among themselves with regard to minor details. A change of even one letter can obliterate a Bible Code find, and the large-skip matches are the most vulnerable. I once was unable to replicate Brendan McKay's find of "CLINTON" in the English (King James) version of Genesis, so I asked for a copy of his text to compare to mine. Comparing the two independent versions, letter by letter, I found they both had multiple errors (in different places), explaining the difference in our results. I used the two versions and the error comparison to make a third version, relatively error-free. The Bible Code Format discussed here is a vague format indeed. The True Bible Codes are a different kettle of fish. There is nothing wrong with your television set. Do not attempt to adjust the picture. We are controlling transmission. If we wish to make it louder, we will bring up the volume. If we wish to make it softer, we will tune it to a whisper. We can reduce the focus to a soft blur, or sharpen it to crystal clarity. We will control the horizontal. We will control the vertical. For the next hour, sit quietly and we will control all that you see and hear. You are about to experience the awe and mystery which reaches from the inner mind to... The "OUTERSECRETS". Albert Einstein - "Great spirits have always encountered violent opposition from mediocre minds." Proudler - "I respond not to those who cannot see truths." Last edited by MINISTERofTRUTH; 13th December 2010 at 06:49 AM. If I'd gotten a dollar for every letter to me starting with "I agree with you that the Bible CodeTM is bunk, but not so my Bible Code...", I'd be much richer. Are the "True Bible Codes" the same ones predicting nuclear attacks in Manhattan by Thursday or Saturday of this week? Our latest date for the start of the Great Tribulation, which we now understand to be the second fire sign of 1Kings18, which is a terror attack in New York, is 2010Tebbeth6-7, which is 2010 December16-18. This is when the Winter of our discontent will begin. 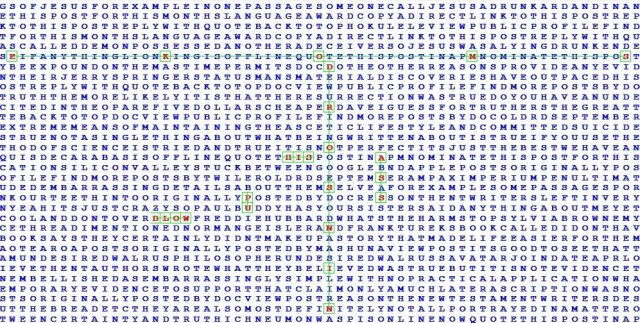 Are there any actual rules to this whole "Bible Code" thing? It looks like you can take any angle, any number of spaces apart, as long as they are in a straight line. With rules like that it seems to me that it would be nearly impossible to NOT find something in a large enough text block. And what is he using as his base text? The Torah in Hebrew? And then using the Hebrew characters to make words in whatever language is convenient? This is just...wow...it's really bad. It's called "EQUIDISTANT LETTER SEQUENCES" (ELS). Basically, you strip all punctuation, numbers and spaces from the Text, leaving only alphabetic characters. The Code is supposed to work only in the Pentateuch (1st 5 books of the Torah), but many coders use the whole bible. Typically, Bible "Codes" are found with thousands of characters intervening, not a couple as shown above. Is it really, really Bad? Yes. Many additional details are provided here. My favorite Bible Code is "assassin will assassinate". I always found that cute. The "nuclear attacks in Manhattan by Thursday or Saturday of this week" is Yet Another Bible Code Bozo. Last edited by MINISTERofTRUTH; 13th December 2010 at 04:09 PM. I'm still waiting for this Bible Code nonsense (or Nostradamus) to accurately predict a significant event that nobody else predicted. Until that happens, nobody should take this crap seriously. What is it about being a whacko that makes them create mile-long web pages? Do they not know how to create and link to other pages? Beats me. Even my web page is shorter that that. The rules are made after you find something "significant." This means you can work forwards, backwards, diagonally, and in any direction until you find something you think is useful. So far, a straight line is assumed, but why not use some other geometrical figure, as long as you make the rules! It's a lot like shooting a rifle bullet at the side of the barn, then drawing a target around the hit and crowing about how great a sharpshooter you are. If you want to "prove" how prophetic your book is, it is better to chose a "holy" book than a popular novel for your source. No one would be impressed if you found something in a NY Times Bestseller list work or a Batman comic. Use an ancient text and it looks like the ancients were not only smarter than us, but sneakier, too. Let's see ... the veiled references to "Outer Secrets", your claims that "The True Bible Codes are a different kettle of fish" ... I suspect you are none other than Kevin Sean Proudler, who boasts "I, K. SEAN PROUDLER , will reward the person who can prove that the following list of Bible decodings are simply coincidental, with the reward of, $100,000 cdn." What is it with Canadians and rewards like this? Oh really? Let's compare and contrast the two whacko web pages under consideration. The Mark of God, Jesus, and Christ, plus the Mark of the Beast. Given these statistics, Sean Kevin Proudler, aka MinisterofTruth, your statement "Even my web page is shorter that that." has been falsified. Last edited by DaveThomasNMSR; 14th December 2010 at 08:50 AM. I don't know. Does the Bible use asterisks? Reason for bump: I want my $100,000 cdn! Since Kevin Sean Proudler (MinisterofTruth) has declined to answer my questions, I'd like to just go ahead and establish why I think he owes me $100,000 Canadian. Proudler's website's Bible Codes page introduces a "new" kind of Bible Code, in which great significance is given to Gematriacal values for English letters (Proudler searches the King James version of the Bible a lot). For example, he assigns "G" a "Code 6" value of 42, as G is the 7th letter, and 7x6 = 42. Likewise, "O" (15th letter) has a Code 6 value of 90, and "D" (4th letter) a value of 24. Thus, "GOD" has a value of 42 + 90 + 24 = 156. Proudler's game is this: he takes any term of interest (GOD, CHRIST, PROUDLER, etc. ), and calculates its Code 6 value. Then, he uses those values to limit the steps for a traditional Bible Code search. He searches for various other terms between such given limits, and gets new numbers for the number of matches for these terms. Adding these new numbers together yields a new number, and if this number matches the Code 6 value for any other word of interest, Proudler claims it a "compelling match." Here, KSP limits the step sizes to those between 1 and 156 (GOD), and then finds the corresponding numbers of matches for three terms (AENINE gave 357 hits, ELEVEN got 63 hits, and TRUTH got 1042 hits.) Summing these, 357+63+1042 = 1462, which contains (462), which is the Code 6 value for CHRIST. 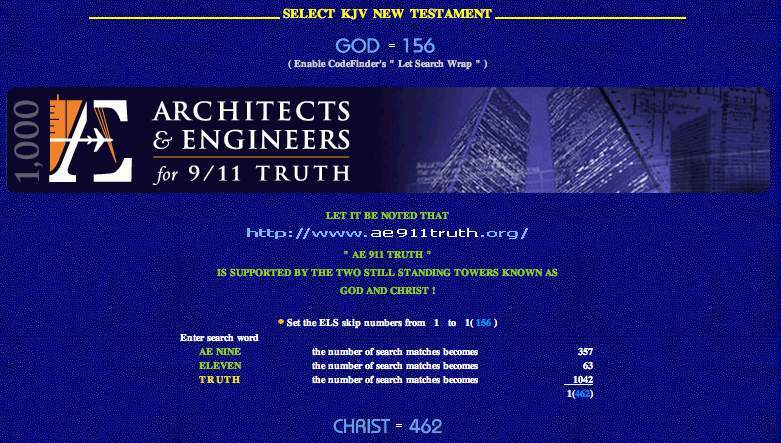 KSP interprets this as meaning that "AE 911 TRUTH IS SUPPORTED BY THE TWO STILL STANDING TOWERS KNOWN AS GOD AND CHRIST !" I, K. SEAN PROUDLER , will reward the person who can prove that the following list of Bible decodings are simply coincidental, with the reward of, $100,000 cdn. Here's why I think I've earned that cash reward. I have adapted my Bible Code application to do Proudler-style searches. Here's what I found code-wise using a couple books of Tolstoy's War and Peace as the search text (not the Bible, natch). Translation: "Searching in War and Peace, and restricting skip intervals to those lying between 378 and 654 (which happen to be the Gematriacal values of 'WACKY' and 'PROUDLER'), I found 162 matches of the word 'IDIOT'; the number 162 also happens to be the Gematrical value of 'CODE'." In other words, "THE WACKY IDIOT CODE CAME FROM PROUDLER." Translation: "Searching in War and Peace, and restricting skip intervals to those lying between 911 and 2001 (references to September 11th, 2001), I found 654 matches of the word 'IDIOT'; the number 654 also happens to be the Gematrical value of 'PROUDLER'." In other words, "THE IDIOT 9/11 CODE CAME FROM PROUDLER." I can crunch these out by the thousands. What do you think, JREFers? Does Proudler owe me the $$$? MinisterofTruth aka KSP, if this isn't good enough for you, I will be happy to come up with new results, in any text of your choosing. That way, you can verify each result as a valid "code." Feel free to suggest an impartial referee to validate the results. Now, if KSP declines to comment, does anyone know what the correct branch of the Canadian Government is for addressing cases of Internet Fraud? You know, Kevin Sean Proudler (aka Minister of Truth) has actually e-mailed me a couple of times in the past, trying to interest me in his "True Bible Code" site. That's why I've done a lot of work producing "Proudler" codes in mundane texts like War and Peace. In this thread, he's again announced his website, but has disappeared since I pointed out how erroneous his statement about the length of his website was in comparison to another wacky Bible Code page. Also, he has vanished since I pointed out that I should be rewarded the $100,000 Proudler has promised to anyone who can show that his Bible decodings are simply coincidental, which I have done. I repeat, MinisterofTruth aka KSP, if this isn't good enough for you, I will be happy to come up with new results, in any text of your choosing. That way, you can verify each result as a valid "code." Feel free to suggest an impartial referee to validate the results. 4 days and counting, Sean. where's my ca$h? Do you know where your integrity is? THANKS for revealing Satan's nasty code work. This has significantly strengthened the codes present within the KJV Bible and the Torah which I have revealed. By the way, I have updated the Torah Video 3.4 min. section. Click on the "JESUS CHRIST = 906" which is positioned just above the Torah Video. How do you figure that? Finding your name associated with IDIOT in War and Peace somehow verifies your work with the bible? Please let us know the logic behind this. Um, MinisterofTruth, have you considered seeing, you know, a psychiatrist? You seem to have some problems. God speaks truth, Satan deceives. It's not that complicated. Click again on " JESUS CHRIST = 906 ". It has been updated a step further concerning the, Word of God, the Holy Father. And yet SATAN =/= 666. And, while I'm at it, whenever I hear this line I always wonder whether the person saying it has read Genesis 2:16 through to the end of Genesis 3. The serpent tells the truth, and God lies. Oh Exalted One, we beleagured masses need your Instruction and Guidance to understand your Thoughts. Please explain in simple English how it is that finding thousands of gematriacal "codes" in a non-sacred text, War and Peace (Tolstoy) in any way "strengthens the codes present within the KJV Bible and the Torah which I have revealed." Cuz, I'm just not seeing that AT ALL. Remember, we mere earthlings are not soaring with you through the Astral Plane. We need what is obvious to you spelled out to us. In particular, exactly what do you require to prove to you that your lists of Bible decodings are simply coincidental? Hmm.....There may be something to this code.